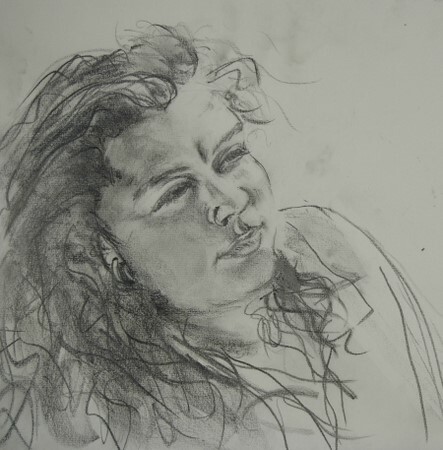 So, here I give you Christeen…..in graphite on paper; then watercolor on Arches and last, oil on linen. All absolutely wonderful! What a huge project…. Ronell, you are one amazingly talented woman!! Holy smokes! These are awesome! Wow, Ronell, these are great! My favorite is the oil – it ‘s so full of life. RONELL! STUNNING! GORGEOUS! PHENOMENAL WORK! MERCY … THIS IS TRULY OUTSTANDING! I like the watercolour one the most! Wonderful work, all three are superb! hese are just lovely! 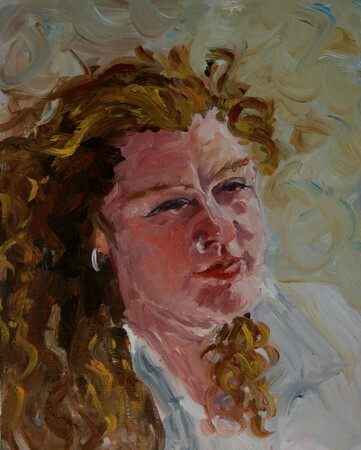 Incredibly good, you captured Christeen perfectly! Ronell, I absolutely agree with Christeen, you´re amanzingly talented!!! I can’t say I have a favourite, I can’t decide since I like the three of them very much. Each one has its own character. GREAT JOB!!! Ronell THese are just super…they got better and better as i scrolled down the page…cant decide WHICH is my favorite…they are all MAGNIFICIENT!! Oh, Ronell, your charcoal is GORGEOUS, and so is Christeen! All of the portraits are wonderful :), but I think I like the second one even best :))! Wow! I think I like the graphite the best, but with your amazing talent it’s really hard to commit to that!!! Thanks for sharing your art with us! Ronell, these are just beautiful. I aspire to be able to paint like you someday. Thank you so much for sharing your lovely work. Lucky Christeen! What a fun project! 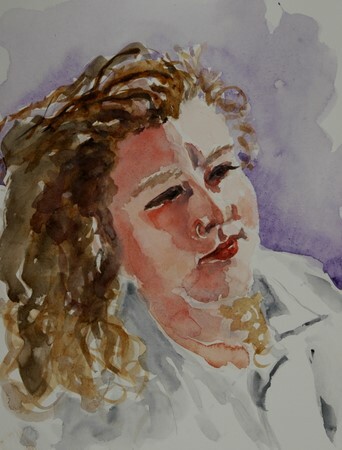 My favorite is the watercolor… nice play of light on the subject. Did Christeen draw you? I love the graphite drawing and keep gong back to it (your model is beautiful by the way). I love to look at your site – I leave feeling inspired. Thank you for all the comments -Sarah…thank you for being so observant..you’re spot on! I’m so glad you did see a littel of what I tried to do…see down below.Nancy: Yes I had a beautiful model to work with!Bec: and Christeen does have a snapshot of me, so when she has time, she’ll do one too.note: This was a very intimidating experience for me….doing a painting of someone you don’t know or haven’t met face to face, and in a weird sense is actually a friend(like you all would agree, I’m sure) and all you have to work with is a photograph – you haven’t seen some personal mannerisms, like how her mouth moves when she smiles, how she crinkles her nose, how she plays with a string of hair, how the light in her eye changes…anything that can give you an idea of something more than physical…. Normally I would’ve preferred to have Christeen’s face say something more than just displaying rendition, tell more of a story, but I didn’t feel confident enough to do that. Who knows, maybe our paths might cross and then I’ll redo these. So I’m going to chime in and say how much I admire your work and your courage as well… I couldn’t say which one I like the most, since they all have a different feeling to them, like showing different aspects of Christeen’s personality? – Would be interesting to know which one she thinks portrays her best? all three are wonderful but the oil is my favourite 😛 sounds like a fun project and i hope we can see christeen’s work too. I love the graphite one, Ronell. it looks so spontaneous and very much from life. That, I find, is terribly difficult to achieve from a photo which usually lends itself to a more formal portrait. You are very clever – I’m so in awe of the oil too! I like the first one best, maybe because I love graphite, maybe because you truly did capture the child in her expression. The last one truly looks like a lioness, even the twirls in the background resemble the presence of a lioness! Awesome! Truly amazing work. You’re not only attempting a likeness of her, but also her essence. That’s very difficult to capture, and yet you did. I think each medium emphasize more of certain characteristic, but all and all they’re all there. Superb job, Ronell. Well done – these are stunning! It’s so interesting seeing them done in three different media, and noticing how each gives a different feel. My favourite has to be the oil painting because I am such a huge fan of your luscious way with oils. Oh, to be able to paint like that! Hello I cant tell you how much your work has inspired me to practice daily and hope that someday I also will be able to turn out wonderful works of art. You are a wonderful artist and I thank-you for letting us see your work hear. wow! how different they all are yet how smashing! Your blog is always a joy to the viewer! Wonderful. They all have there own charm. I love the eyes from the graphite one, but my favorite is the one in oil. It is hard to tell which one strikes me the most — as each of them stresses something different about Christeen. Love her hair in the graphite one. I keep coming back to marvel at these. I’ve never seen a drawing or painting of myself before, and I enjoy them SO much!Your graphite drawing really captures how my hair feels to me- men have lost watches in it! It can be incridibly difficult to coerce into submission!I love the loose, fresh approach in the watercolor. You’ve made the light SO beautiful- I feel like I’m outside, just looking at it. I am also impressed with how you kept the line of my nosering thin and delicate in the midst of those wonderful washes of color. You’ve got my squint wonderfully.And the oil- wow. The brushstrokes are really lively. Thje background supports your lionine take on my hair, and suggests wind tossing it around (and it was VERY windy the day I took that shot). The colors are luscious. The colors you’ve used for my skin are particularly impressive to me.So, all that said, thank you SO much for applying your creative talents to this swap of photos! You’ve inspired and impressed me, and I’m so glad we gave it a try. Great work Ronell – not just this post throughout your blog. These are great, I think I like the pencil one the best. You’ve been so busy! You and Christeen have really taken this challenge by the horns. I think the oil is especially good. These are great, I love the color and texture in the last one. What a grand project! I love the graphite the best, but that’s just me. All of them are simply superb.